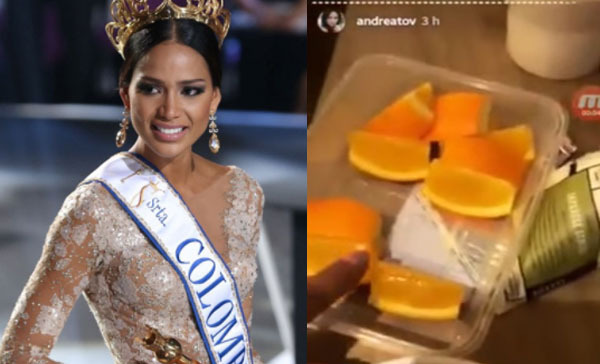 Miss Colombia Andrea Tovar angers netizens for her Mexican accent joke and being ungrateful for the complementary gifts she received from her hotel in the Philippines. Andrea Tovar has not made any comment yet about the issue. Miss Colombia Andrea Tovar is in the Philippines to compete in the upcoming Miss Universe 2016 beauty pageant. Meanwhile, the Miss Universe organization is set to crown a new queen at the Mall of Asia Arena on January 30, 2017. Pia Wurtzbach of the Philippines will crown her successor at the end of the event. Also, Steve Harvey will again serve as host together with Ashley Graham. What can you say about Miss Colombia Andrea Tovar’s statement? Share your thought and views on the discussion box below. Fo more Miss Universe 2016 news and updates, follow us on Facebook and Twitter.